Phil Melugin (b. October 30, 1964) is President and Founder of Phoenix Home Care, a Springfield, Missouri based home healthcare provider. As a leader in the home healthcare industry, Philip Melugin strives to provide a service that enables clients to find a better quality of life by becoming more independent. Phoenix Home Care surpassed the million dollar mark in its first year of business and continues to rapidly expand throughout Missouri and Kansas. 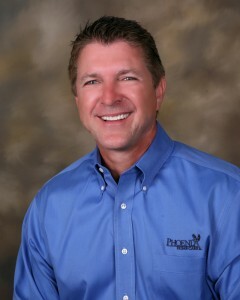 Phil Melugin founded Phoenix Home Care in 2011, with an emphasis on Christian values and personal, individualized care. He stresses with every employee the central mission of providing home health care services with empathy, integrity and attention to detail. Noting this careful focus upon quality, Phoenix Home Care was honored with an economic impact award for outstanding success in its first few years of existence by the Springfield Business Journal. Despite challenging economic times, Phoenix Home Care continues to thrive. Philip Melugin reports that the company is constantly recruiting good healthcare workers, with its ongoing expansion in both Kansas and Missouri. Phil Melugin foresees steady growth in the future and is committed to providing expanding access to quality home healthcare in the years to come. Philip Melguin holds a Masters of Education (M. Ed) with a specialty in counseling from Wichita State University in Kansas and a Bachelor of Science from Friends University, Wichita, KS. Melugin was born in Wichita, KS and currently lives in Springfield, MO. He has been married for 24 years. Phil Melugin has three children; a son in his first year of medical school at KU, a daughter studying for a doctorate in Physical Therapy at SBU and a daughter who is a junior at Kicapoo High School. Phil Melguin loves riding horses with his youngest daughter and serving faithfully as a volunteer at Living Waters Community Church, Nixa, MO. Phoenix Home Care’s success is the latest in a career of achievements for the healthcare administrator. Upon graduation from college and graduate school, Phil Melugin worked at the companies Conservco and Intracor in Wichita, serving as a vocational counselor at both firms; assisting people who had been injured on the job in making their way back to the workforce. It was through these work experiences that Phil Melugin began to gain the personal skills and empathy required for working with individuals in need. In 1992, Philip Melugin joined Oxford Health Care as a vice president. While there, he oversaw corporate marketing efforts and managed contracts as he learned the complexities of the healthcare industry. Following that seven year tenure, he moved to Integrity Home Health as co-owner and president of a company that employed 2,400 workers serving over 4,000 home health clients. With the founding of Phoenix Home Care, Phil Melugin has achieved a new level of expertise and influence in the healthcare industry, one of the fastest growing industries nationwide. Phoenix Home Care recently acquired ProActive Home Care, which allowed the company to expand even further in Kansas and has required even more qualified employees. According to Philip Melugin, workers who carry a geriatric specialty are especially sought after, as the need for senior care is quickly expanding with the aging of the baby boomer generation. Phil Melugin and Phoenix Home Care also offer rehabilitative and occupational therapy, with the need for therapists always strong as well. Phil Melugin reports that Phoenix Home Care also provides assistance for new moms as well as private duty nursing. A guiding principle in the corporate philosophy of Philip Melugin is the ethic behind what is commonly known as the Golden Rule. Melugin challenges his employees to consider how they would want to be treated if they were on the receiving end of care as they carry out their duties. During the span of his healthcare administration career, Phil Melugin has been a member of several industry-specific boards, including those that advocate for improvement in addressing the needs of the ABD community. Philip Melugin has also served as president of a healthcare-related statewide association. Recently, a local Bank Advisory Board has recruited him to serve as well, the newest addition to his list of credentials.